Other than the pine pollen invasion we had a near perfect morning for the race with cool temps and low humidity. Nice to know that was one thing not to worry about. The way my running has been going lately I was feeling pretty confident of having a good race but a nasty hill in the first mile had me a bit worried about achieving my goal of a sub 22. I did my usual warmup routine and then lined up with Amy and the rest of the Surrette family. We were not planning to run together since we each were aiming for a test of how fast we could run and hopefully both make it to the podium. She certainly didn't need me to pace her for a 5k ! I was hoping we would be very close for most of the race though. Amy and her son Drew got off to a fast start but I stayed focused on my own run and by 1/4 mile I had pulled even with Amy, feeling smooth and hoping we could stick together. We hit the hill at about the 3/10 mark and I settled in for the climb. It starts off fairly steep for a couple of hundred yards but then eases off the incline a bit. I was surprised at how well I was running up and quickly pulled ahead of Amy. There was a man right with me but I didn't recognize him. I hit the 1 mile mark in6:54 which shocked me. I was expecting to run around 7:30 with that climb. The turn around came shortly after the mark and I began to push the pace. I could see Amy was not too far behind running strong. 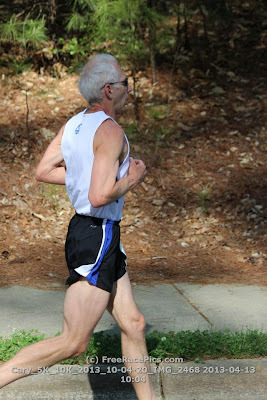 As I reached the steep part of the downhill I was letting it all out and hit the turn onto the lake at about 1.7 miles. I was working hard and came up on mile two in 13:16, a 6:21 mile ! I haven't run a mile that fast in 30 years ! 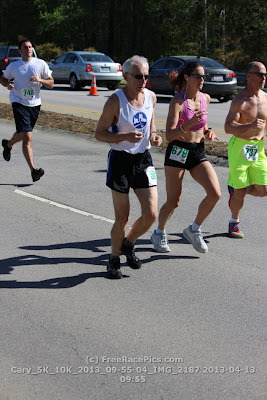 I was now having visions of actually running faster than my Selma 5k time from 2006 which is my fastest since 1991. I continued to work hard and as usual it probably sounded like I was dying to anyone that could hear me. I felt like I was holding pace but I hit mile 3 in 7:24 which makes me question if they had the timer at the right spot for mile 2. It was a certified course but to adjust for the 2 lap 10 k the turn around was a little different so the 2 mile marks were different too. Kicked it hard to the finish and was ecstatic with my time of 21:24 ! I waited for Amy and she came in about 45 seconds later in 22:12 ! Woohooo ! We waited for the rest of her family and then got ready for the awards ceremony. I was able to win 1st Grandmaster and a $40 gift card. And that guy that was with me at mile 1 ? 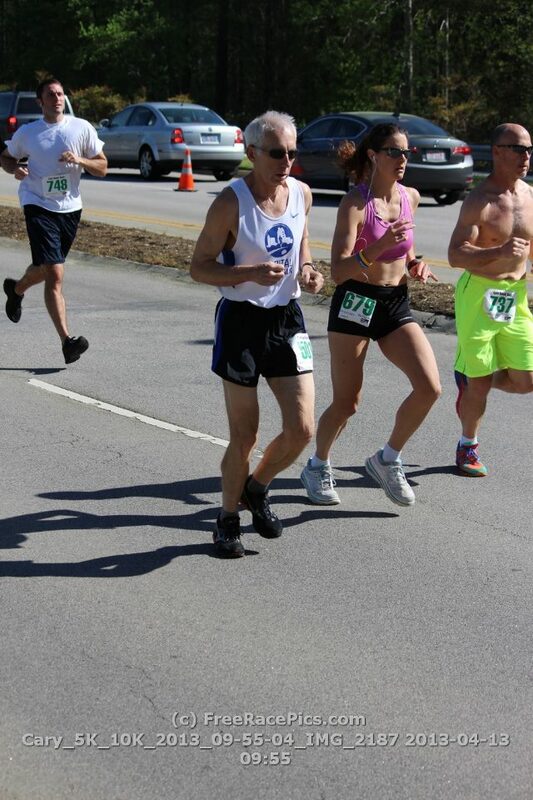 He turned out to be Tim Beck, a strong runner in my age group that I don't recall ever beating until today was 2nd. As promised Amy not only made the podium but instead of an age group placing She was 3rd woman overall !!!!!! Her son drew was 3rd in the 13 and under and her husband Andy was 2nd in the 40-44 group. great day for all of us ! All the hard training, running as well as all the strength, core and yoga are really paying off. The result today almost makes me want to concentrate more on some speed. Almost. But next I got a 100 mile pr to shoot for followed by a marathon pr attempt but don;t be surprised to see a few more road races in the training mix.